[New for 2013] Ok, continuing with our end of year clear out, there is one Front Porch sample that I forgot to show you guys. 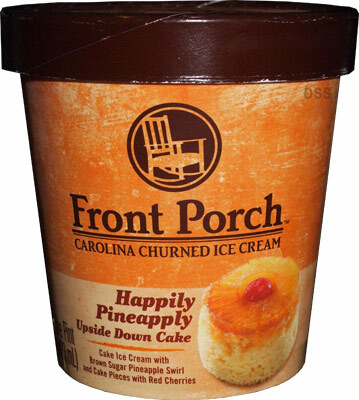 Wait, quick refresher: Front Porch is the premium pint lineup from Mooresville Ice Cream out of North Carolina. They added four new flavors this year and sent them all over for review. They've all been tasty with my only minor compliant being that the other three pints where all light on the mix-ins. The great news is that the sample has held up really well (way to go deep freezer!). This is definitely an intriguing shot since you just don't see too many light colored swirls like this out there. There's a faint smell of pineapple to go with the visuals, but nothing major. 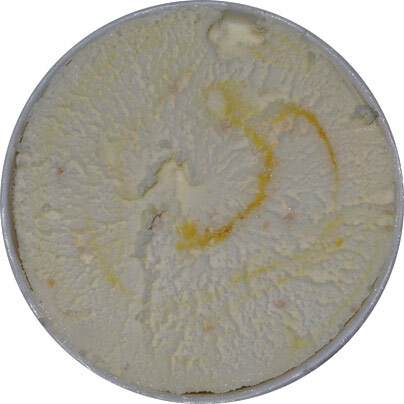 First bite: there's a little bit of pineapple bite to it, but overall it's pleasant with a hint of cheesecake to it. I know it just says cake flavor, but with the base and the swirl, may tastebuds are registering cheesecake. That's not a knock, instead it adds to the fun of the flavor. As with the other flavors, I'm not running in to a ton of mix-ins, or a ton of swirl for that matter. Hehehe, just got a little bit of typical cherry tang on that bite, but the cherry bits are rare too. Ok, with a softer texture and with the edges melting fairly quickly, the it just further enhances that cheesecake vibe... which is totally hitting the spot at this exact moment. And now about 40% of the container is gone and I feel refreshed and ready to tackle the afternoon. Very cool. Sure, there could (and probably should) be more swirl to rock a true pineapple flavor, but since I'm not a big pineapple fan, this was an easy snack for me. 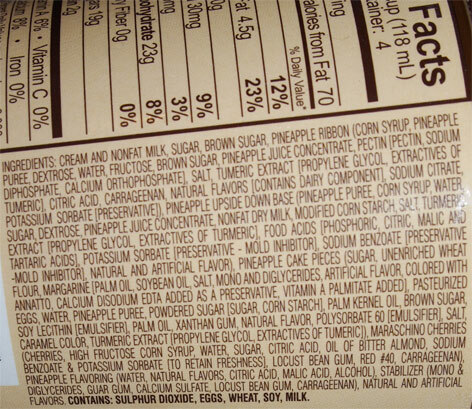 One final note: This is one massive ingredient list. Granted you've got a base, swirl, and mix-ins, but this thing is huge.. though to be honest, I didn't think much of it until I saw CONTAINS: SULPHUR DIOXIDE. I'm not sure I've ever seen that before on an ice cream... must be related to the fruit right? You saved one of the best for last huh? Flavor idea wise, this is brilliant and I would love to see a company like TH or HD tackle it and hit it out of the park! "though to be honest, I didn't think much of it until I saw CONTAINS: SULPHUR DIOXIDE. I'm not sure I've ever seen that before on an ice cream... must be related to the fruit right?" Dubba, you are right. As I recall sulphur dioxide helps deactivate bromalin and preserve the pineapple when dehyrating it. Untreated pineapple breaks down more easily due to the presence of bromalin (an enzyme built into the pineapple as its own 'self-destruct' device. Bromalin in pineapple-containing juice drinks start breaking down the sugars immediately after opening and overwhelm the original mixture and taste in as little as 1-2 days. This tidbit is from my days as a Food Science student. My goof, Dubba. Enzymes break down protein, not sugars. My guess is that yeast (introduced into the container when the pineapple drink is exposed to air and then sealed) digest the sugars in the drink, while the bromelain digests the yeast proteins. In as little as two days in your refrigerator this combo makes for a disagreeable tasting bloom in your beverage.